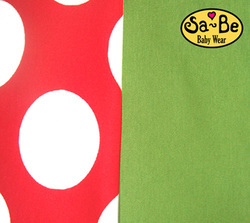 Stretchy wraps are made of a soft, stretchy fabric that moulds around you and your child. They are most suited for young babies and can be used on the front and hip (Sheffield Sling Library does not advise back carries with a stretchy). This wrap is a hybrid between a stretchy and a woven. All measurements are approximate. Please refer to manufacturers websites for more detailed information. Most slings can be used safely with children of a variety of weights/ ages. The ages suggested here are approximate and provide a guideline for the optimum age.